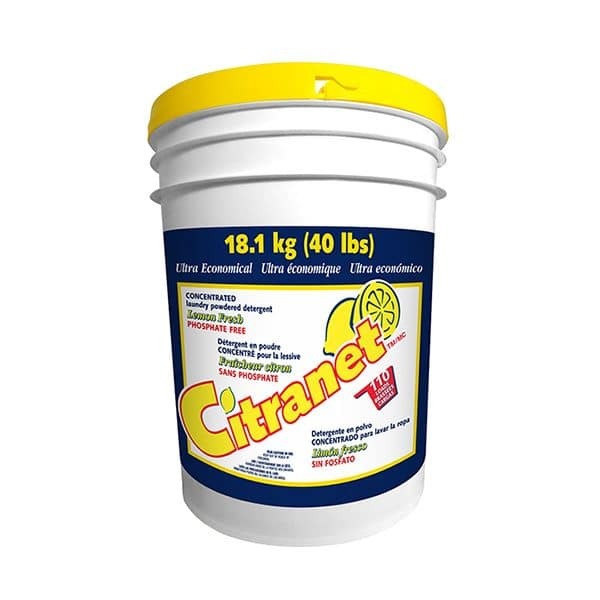 CITRANET is ideal for all machine washable fabrics, and is highly effective in removing all types of stubborn stains. This Lemon-Scented Laundry Detergent easily dissolves in all types of water temperatures and hardness leaving laundry clean and fresh smelling. Sort laundry by colour, amount of soil, fabric type. Select water temperature; hot for white, colorfast, pastels; warm for colorfast brights, lights, nylons, woolens and polyester; cold for dark or bright colours, delicate washable fabrics. Use the correct amount of CITRANET laundry detergent; 1/4 plastic cup (60 ml) for washer/dryer combination; 1/2 plastic cup (120 ml) for a tumbler and 3/4 cup (180 ml) for an agitator, wringer and spinner. Evaluate the soap quantity according to the size of the load and the dirtiness of clothes. Add the CITRANET detergent to the wash water before adding laundry. For stubborn stains: Apply a paste of detergent and hot water to stain, rub gently and let stand for 15 minutes. Wash in lukewarm water. Bleach: Check garment label before use. Add bleach to wash solution 5 minutes after the mean cycle begins. Never mix bleach directly with the dry powder. Phosphate free.